BIOSALT is an alternative to ordinary table salt. While ordinary table salt is almost 100% Sodium Chloride, many doctors agree it can produce harmful effects in the body due to Sodium actively “trading places” with Potassium in important instances, such as in one’s skin, veins & arteries, muscles, etc. That’s a prime reason patients often receive instructions to eliminate ordinary table salt from their diets. 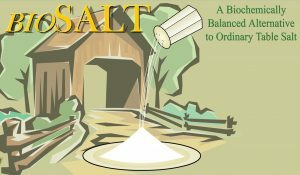 Regular use of BioSALT instead of ordinary table salt is a positive and easy step towards alleviating Sodium toxicity and Potassium deficiency through a table salt containing sufficient Potassium to balance its Sodium content. Moreover, BioSALT is biochemically balanced to correspond to the array of minerals and elements needed in healthy human plasma and in the ratio the body uses it.